Each time I log on to LinkedIn I find that another person has kindly (thank you) endorsed me. Sometimes I know the endorsee, at other times, I don’t. Give kudos with just one click: On LinkedIn, you have many smart, talented, and skilled professional connections. Starting today, we are introducing Endorsements, a new feature that makes it easier to recognize them for their skills and expertise. So for the purposes of Research, just so I can verify at least one of my endorsements, I have kindly accepted all the endorsements (thanks, again) to see the scope of what people think I can actually do. 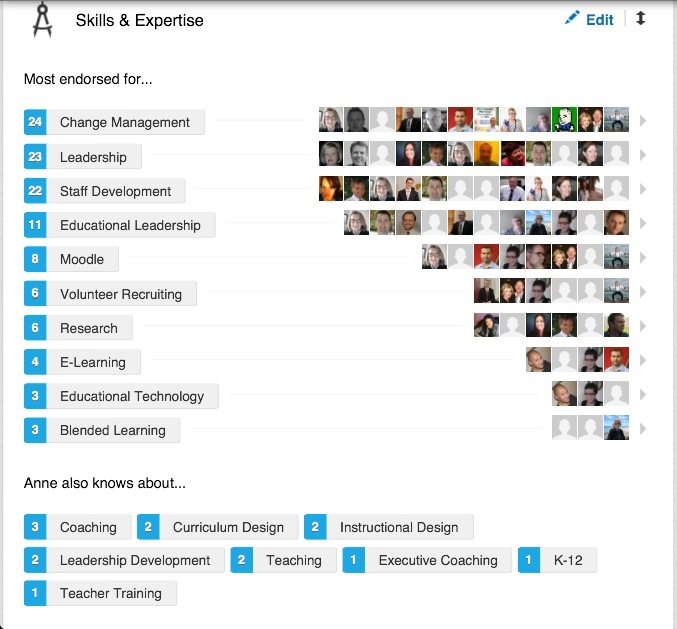 I’m happy with Change Management being the most endorsed skill (Did I say thanks?) as that is probably one of the most common themes in my communication, along with Leadership. From there, Staff Development and Educational Leadership also fit, as I want to see people grow and encourage change in schools. Some of the others, Volunteer Recruiting, Coaching, Leadership Development also reflect elements of my passion. But I wouldn’t really say that Moodle is a particular skill or expertise I possess (ask my colleagues), nor is Curriculum Design. And Research? This is about as deep I get into it. So I need to let you know, dear reader, I don’t think much of the LinkedIn endorsements. I do appreciate that people, some I’ve never worked with or met, would like to endorse me, however, I just need to let you know that I won’t be endorsing you back. Basically, I think that this is just one, in a long line of marketing ideas, that LinkedIn will introduce to keep us interested. If I do endorse you, I will do it personally. But, hey, thanks for thinking of me .